Quick update: The book I co-authored with Liz Fosslien is out now: No Hard Feelings: The Secret Power of Emotions. The book is a Wall Street Journal bestseller, was featured in The New York Times, and was selected for the Next Big Idea Club. You can read more about the book here and sign up for our monthly newsletter here. Follow us on instagram for weekly illustrations! Every quarter, I share helpful summaries and excerpts of the best books, podcasts, and articles I’ve read about culture. 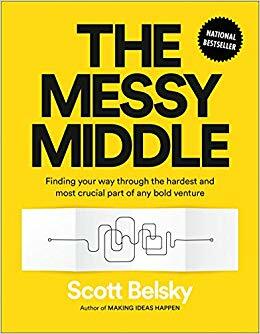 The Messy Middle is a guide to "navigating the volatility of new ventures and leading bold creative projects by Scott Belsky, entrepreneur and Chief Product Officer at Adobe. “Creating something from nothing is an unpredictable journey. The first mile births a new idea into existence, and the final mile is all about letting go.” The book argues that the middle stretch is the most important and often the most ignored and misunderstood. Culture is created through the stories your team tells. The term “culture” is casually thrown around as if it can be designed in a conscious way: a cocktail hour here, a foosball table there. But culture is not in any manager’s control. It’s organically formed through the stories your team tells. …[Stories] orient new employees and provide institutional knowledge. Even amid long periods of ambiguity and uncertainty, a healthy culture built on stories provides the context and comfort everyone needs to stick together and keep moving forward. As a company grows, culture becomes less impacted by everyday stories and is floated on the remnants of the stories that happened early on. Tales from “the beginning” tend to have an outsized impact on the culture as they reflect the core, founding values of why and how this whole thing got started in the first place…Over time, even if the stories themselves are forgotten, the beliefs, values, and nuances of a company’s culture are collectively held by everyone. You need to be present… especially in the early days. You need to recall [the stories] on the right occasions. And you need to let go of the reins and allow the characters on your team to begin making their own. Every team has a few “culture carriers” that are especially good at capturing great stories and retelling them. As the founder of a project of team, take stories seriously. Airbnb’s brand is all about creating a sense of belonging, and not just for their guests and hosts. They actually have a group of employees (10 people in San Francisco and someone in almost every office in the world) whose role it is to take the values off the walls and into the halls. Similar to the role of ground control in an airline, the group takes care of the office environments, events, internal communications, employee recognition, celebrations, and even the design of the office. According to Mark Levy, the former head of employee experience, these people aren’t “forcing fun, they’re reinforcing and supporting how we bring the culture alive.” Levy says, “They do it through pop-up birthday celebrations, anniversaries, or baby showers as well as creative themed events based on holidays or events— whether it’s Pride of the launch of their entry into Cuba.” This is the kind of effort it takes to truly scale culture." “So here you are. You’ve just joined Jellyvision, and we want to talk about the END of your employment here. What’s up with that?" That is the beginning of the Graceful Leave Policy at Jellyvision, the maker of interactive software. The idea is that each person Jellyvision hires is so valuable, and finding a replacement is so tricky, that out of respect, Jellyvision asks employees to notify the company when they start to look for a new job, apply to school, etc. In exchange for this respect, employees will get the support of Jellyvision in their job search, contacts and introductions, resume assistance, and even prorated compensation. After an employee shares such wishes with Jellyvision, he or she will continue to be staffed on projects that “make sense” given the timing of the departure (some people have stayed on for more than six months), and employees are expected to work hard until the end. Parting ways is never easy, but at Jellyvision it’s done with the human touch. In this episode of How I Built This, Guy Raz interviews Stewart Butterfield, founder of Slack. Butterfield talks about how to it's important to get the entire organization aligned to create a good culture. He shares that it’s easy to do this with 8 people, but much harder with hundreds. You can now pre-order my book, No Hard Feelings! You can subscribe to our monthly book newsletter here. From an organizational culture lens, Gelfand writes about how the merger of Daimler-Benz and Chrysler in 1998 was plagued by a mismatch of a loose culture (American company Chrysler) and a tight culture (German company Daimler). Integrating these two companies was hard work. Daimler could either “compromise or cannibalize,” and it chose to cannibalize. They dispatched German managers to Detroit, and laid off American managers. Unsurprisingly, trust between the two groups plummeted. What followed was 9 years of decline in employee morale and stock price. The two companies split up in 2007. The lesson is: when merging organizations don’t consider cultural compatibility, specifically around tight and loose cultures, they can face huge challenges. Gelfand also writes about how even within the same industry, different organizations can be tight and loose, and gives an example about IDEO! There is so much more you can learn from this book! Check it out for yourself here. “Companies love to declare “We’re all family here.” No you’re not. Neither are we at Basecamp. We’re co-workers. That doesn’t mean we don’t care about one another. That doesn’t mean we won’t go out of our way for one another. We do care and we do help. But a family we are not. And neither is your business. …Whenever executives talk about how their company is really like a big ‘ol family, beware. They’re usually not referring to how the company is going to protect you no matter what or love you unconditionally. You, like healthy families would. Their motive is rather move likely to be a unidirectional form of sacrifice: yours. “Tobias Lutke, CEO at Shopify, coined the term: “Another concept we talk a lot about is something called the ‘trust battery.’ It’s charged at 50 percent when people are first hired. And then every time you work with someone at the company, the trust battery between the two of you is either charged or discharged, based on things like whether you deliver on what you promise. “When the boss says ‘My door is always open,’ it’s a cop-out, not an invitation. One that puts the onus of speaking up entirely on employees. Read more of It Doesn’t Have to Be Crazy at Work. I loved Jake Knapp’s book Sprint (and have dog-eared many pages as reference) about how to run a one week design sprint. In this article, Rasmus Belter writes about how to run a design sprint while developing a strong team spirit along the way. Even if you’re not running a design sprint, you can steal some of these team development exercises to use on your own.